The Zuni people of New Mexico are famous for their smart water conservation practices. This talented Native American tribe was 'way ahead of other farmers in North America with their irrigation practices. "Irrigation" means bringing water to crops when water doesn't flow by them naturally. The Zuni people lived in a hot, dry area, so their ability to keep their food crops watered with their innovative techniques was a real plus. A "waffle garden" is simply the way the Zuni people sculpted the soil before they planted their seeds. 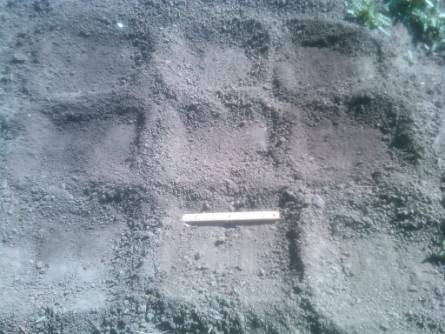 The grid of raised soil, with a lower area inside, kept rainfall in place around the plants' roots, and not run off and be wasted. You can make a Zuni Waffle Garden simply by cultivating, or digging, a garden area big enough for at least three squares across and three squares down. It will look like a tic-tac-toe board of dirt! Use various garden tools and dig down about one foot. The soil should be broken down into the consistency of brownie mix, with very few clods. Break up any clods that remain with your hands. Then go to the upper left corner of your plot. Drag a ruler toward you and back away from you, and then from side to side. You will end up with one square foot of soil on a lower level, with a ridge of dirt on all four sides. Now move to the right, and make another square in the same way. See how you are forming a grid that's like a waffle? Keep going until you have the number of squares you want. 3. squash vine, which will sprawl around and shade the soil under the corn and beans, keeping weeds down. You can plant whatever you would like in yours. Plant seeds in April to mid-May. Plant three of each in each square to make sure you get at least one healthy start. Water daily and watch the seedlings sprout. When they're about three inches tall, choose a "winner" and cut off the other two rejects of each type of plant at the soil line and let them die. That's OK - you just want one good plant of each kind in each square or it'll be too crowded. If you're starting later than mid-May, purchase started plants if you're working any later. Then, when you water your garden, simply hold the hose inside each square of the grid for a few seconds and let the water sink in. It's a good idea to water your garden every day for the first week, and then every other day for the second week, and after that, water a couple of times of week, depending on whether it rained or how hot it is. The Zuni people had to deal with desert conditions . . . but you have access to a garden hose, so use it! A word of warning: bunnies LOVE these plants, so you might talk to a parent about building a chicken wire fence around your waffle garden. Also note that your squash vines will probably sprawl out in several directions, so it might be helpful to have extra space outside your grid. It's also fun to plant a different color and type of flower in each square of your Zuni Waffle Garden. When they bloom, it looks like a colorful quilt!